On September 4, 2017 the inauguration of the work of Miren Argia took place. 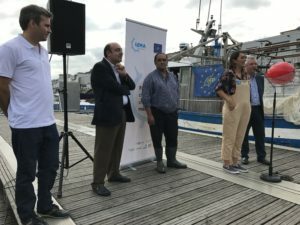 This adapted fishing vessel is one of the five vessels of the Life LEMA project dedicated to marine litter collection in the southeast waters of the Bay of Biscay. The inaguration of Miren Argia vessel in fishing marine litter in the hand of Irene Ruiz from AZTI. 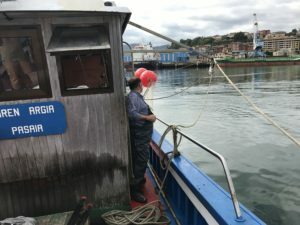 Throughout the operative period of the ship (70 days in 2017 and 100 days in 2018) it is expected that 50 tons of marine litter will be collected on the Gipuzkoa coast. 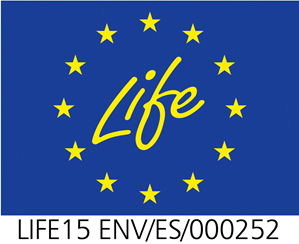 In addition, this work will help to have real data on which are the spots of accumulation and what type of marine litter accumulates in these places. Miren Argia vessel leaving port. This data will allow modeling and designing future tools to predict the presence of marine litter. For the collection of floating marine litter the boat will go to the current lines where, usually, there is more presence of marine litter. Once the marine litter is located, the vessel will introduce the net into the water. When the net is full, it will be hoisted to the deck and later, the marine litter will be transfered and characterized in the port.